Library image #3716: A small group of saguaro cacti. The United States Congress designated the East Cactus Plain Wilderness (map) in 1990 and it now has a total of 14,630 acres. All of this wilderness is located in Arizona and is managed by the Bureau of Land Management. An immense desert with an intricate crescent-dune topography, the East Cactus Plain Wilderness is a land of shifting sands interspersed with more stable structures. This Wilderness encompasses the eastern third of the Cactus Plain and ranges in elevation from approximately 1,200 to 1,500 feet. Dense dune-shrub vegetation grows here, and some of the plants--such as woolly heads, sand flat milk vetch, Death Valley Mormon tea, and linearleaf sand spurge--are seldom, if ever, found elsewhere in Arizona. The elf owl, flat-tailed horned lizard, and the Mojave Desert fringe-toed lizard roam this land, often beyond human purview. Desert quiet reigns on Cactus Plain, and the early morning and late afternoon sunlight slants eerily across a barren and pinkish land. Temperatures range from lows near 25 degrees F. in the months of December and January to highs that may exceed 115 degrees F. from July through September. You'll find no trails. Carry plenty of water, as this area only receives 2 to 8 inches of rainfall per year, and be sure to bring a map and compass. 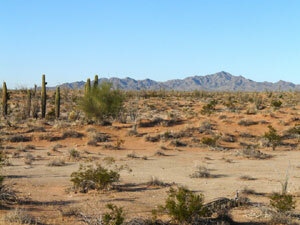 Planning to Visit the East Cactus Plain Wilderness? How to follow the seven standard Leave No Trace principles differs in different parts of the country (desert vs. Rocky Mountains). Click on any of the principles listed below to learn more about how they apply in the East Cactus Plain Wilderness.